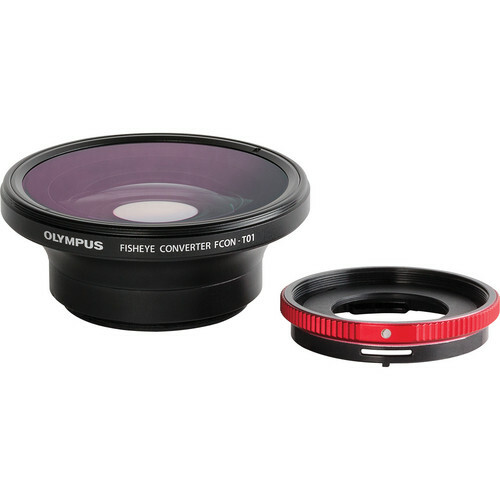 The Olympus Fisheye Tough Lens Pack contains both the FCON-T01 Fisheye Converter Lens and the CLA-T01 Conversion Lens Adapter for use on Olympus Tough TG-1, TG-2, TG-3, and TG-4 digital cameras. The 0.76x fisheye converter lens renders the TG-1, 2, 3, and 4's built-in lens as a 19mm wide-angle with the ability to depict imagery with a 130° rounded perspective. Also, like the cameras, this lens has a waterproof design and can be attached to the camera lens while underwater. The included conversion lens adapter provides the ability to mount this fisheye converter lens as well as additional lens accessories featuring a 40.5mm threaded connection. Compatible Camera Olympus Tough TG-1 iHS. CLA-T01 conversion lens adapter is required. Box Dimensions (LxWxH) 3.4 x 3.3 x 3.4"